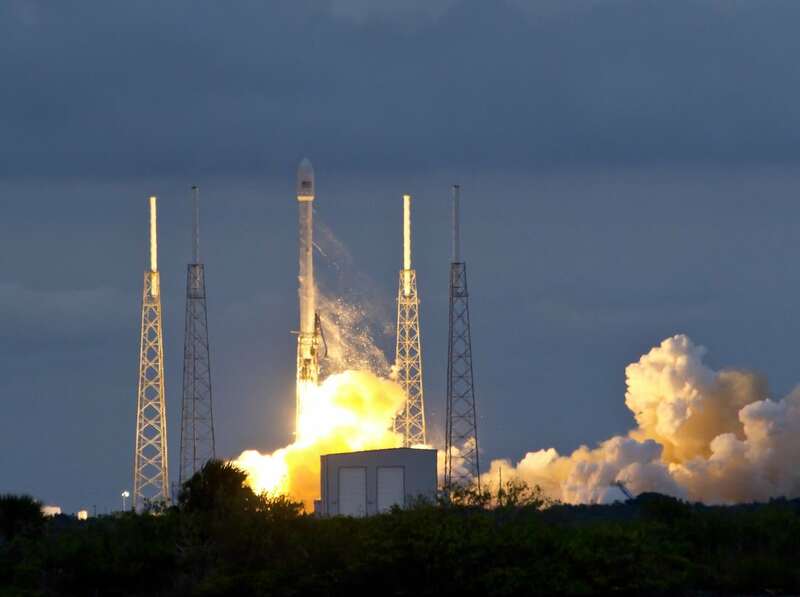 SpaceX began 2014 with a spectacular big bang for private space today, Jan. 6, when the firms next generation Falcon 9 rocket blasted off for the first time this year and successfully delivered the Thaicom 6 commercial broadcasting satellite to its target orbit. 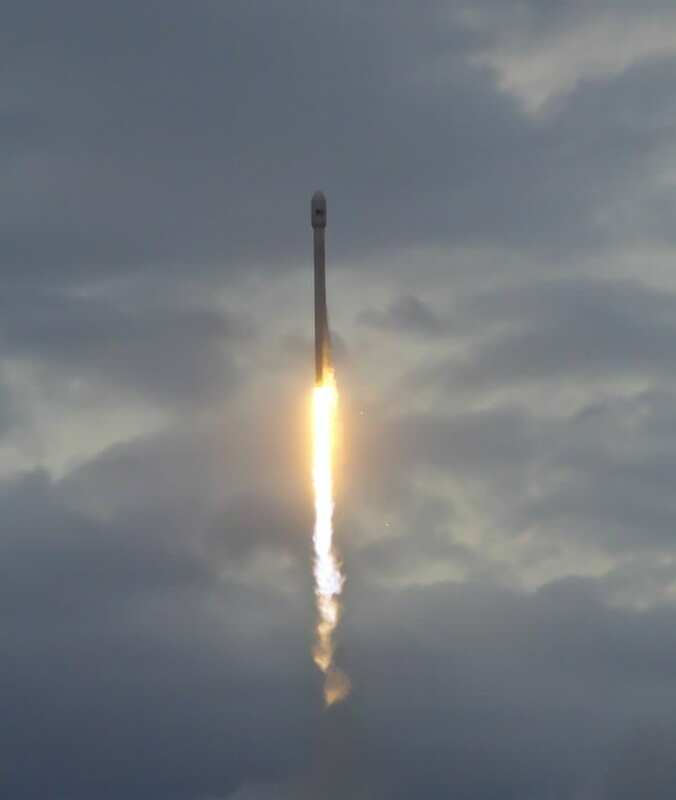 The new, next generation Falcon 9 rocket lifted off at 5:06 p.m. EST (2206 GMT) from Cape Canaveral Air Force Station, Florida with the Thai payload. 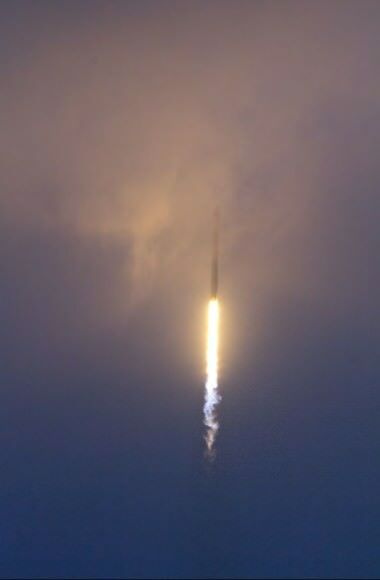 The sunset SpaceX launch from the Florida Space Coast took place precisely on time with ignition of the nine Merlin 1-D first stage engines at Space Launch Complex 40. 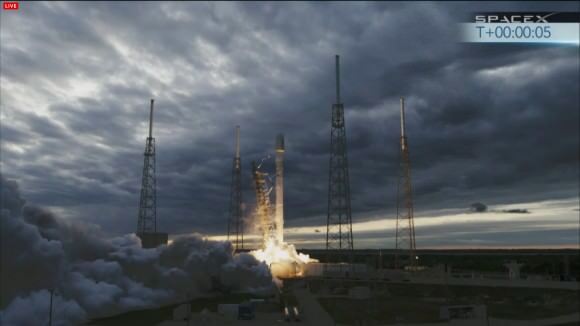 The launch was broadcast live via a SpaceX webcast. The nine engines on the 224 foot tall Falcon 9 v1.1 rocket generate 1.3 million pounds of thrust, about 50% more than the initial Falcon 9. The second stage Merlin vacuum engine fired twice as planned. 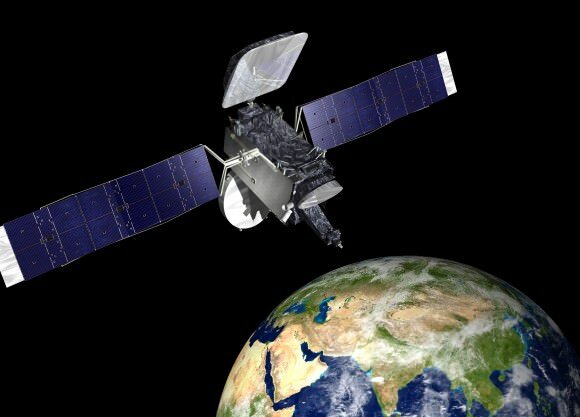 The first firing began approximately 184 seconds into flight and lasted five minutes and 35 second to deliver Thaicom 6 into its parking orbit. The engine relit for a second burn eighteen minutes later and lasted just over one minute to carry the satellite to its final geostationary transfer orbit. The restart of the Falcon 9 second stage is a requirement for all geostationary transfer missions. 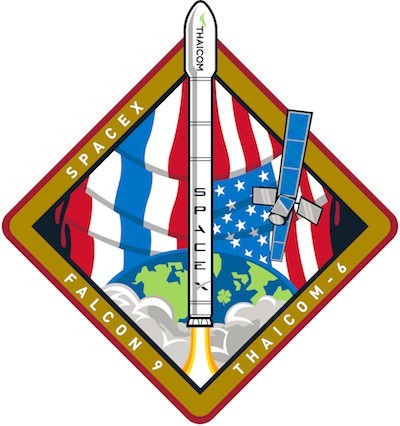 31 minutes after liftoff the Thaicom 6 spacecraft separated from the Falcon 9 launch vehicle and was placed into the desired geosynchronous transfer orbit of 295 x 90,000 km geosynchronous at 22.5 degrees inclination. This marks the second launch of the upgraded Falcon 9 in just over a month, following closely on the heels of the maiden flight from Cape Canaveral on Dec. 3 with another commercial satellite, namely SES-8. 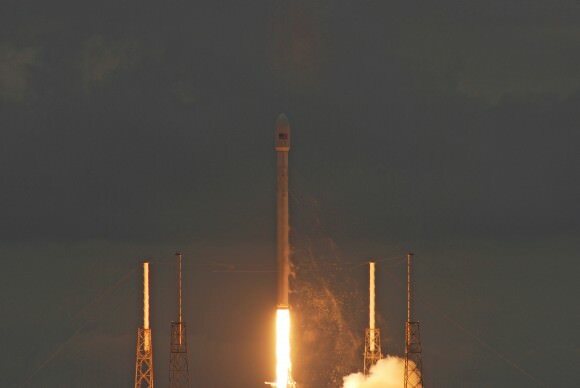 Both the Thaicom-6 and SES-8 satellites were built by Orbital Sciences, one of SpaceX’s chief competitors in the commercial space race, making for strange bedfellows. Indeed it’s a very busy week for private rockets. Orbital Sciences is poised to launch their Antares rocket in less than 48 hours on Wednesday, Jan. 8 on a commercial resupply mission for NASA that’s bound for the international Space Station (ISS). The new Falcon 9 is the key to fulfilling SpaceX’s future launch manifest of nearly 50 payloads worth billions of dollars for a diverse customer base. The next gen Falcon 9 will also launch the human rated SpaceX Dragon to the ISS in a bid to restore America’s human spaceflight capability. 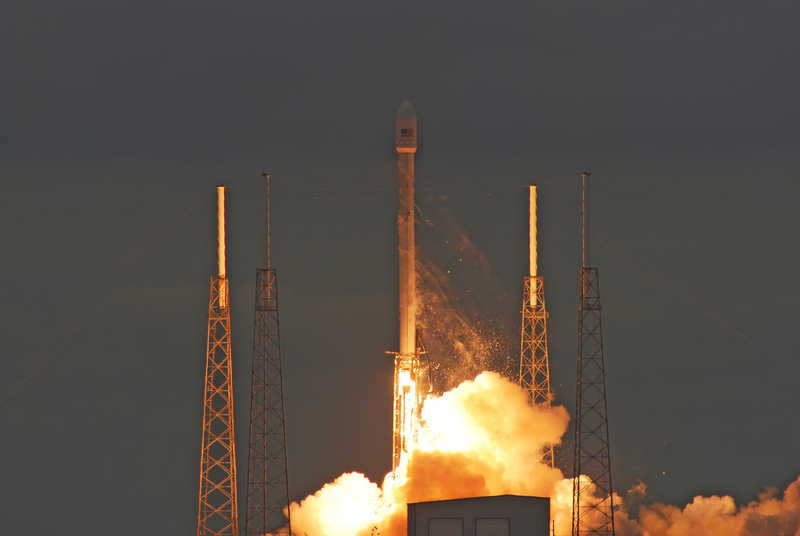 A pair of critical Falcon 9/Dragon abort tests are planned for 2014. Read my new article and discussion with SpaceX CEO Elon Musk – here. The next SpaceX Dragon cargo launch to the ISS is currently scheduled for Feb. 22, said SpaceX spokeswoman Emily Shanklin told Universe Today. Stay tuned here for Ken’s continuing SpaceX, Orbital Sciences, commercial space, Chang’e-3, LADEE, Mars and more news. Ken: I see where you’re coming from, but the Falcon 9v1.1 is now 3 successful launches in. It’s no longer “next gen”, it’s become “current gen”. Now the Falcon 9R is the new “next gen” product coming out of SpaceX in the future. The Falcon Heavy will basically be three of these boosters acting in concert to produce 3X 1.5 million = 4.5 million lbs of thrust? After boost phase, will the boosters separate and fly back to the launch site for vertical landing(s)? first, leaving the middle core in place to burn for a longer time. complete, it will burn its internal reserve. except it will be 90000 feet in the air and moving at mach 6. This is what allows the Falcon Heavy to carry such a heavy payload compared to rockets that are really very similar in most other ways. And yes, because the two outer cores separate at a mere mach 6, they should be able to fly back to the launch site. At those speeds I’d image that even a parachute landing might start to become more feasible (Falcon 9v1.1 first stage separates at mach 10, which is too fast for a parachute assisted decent to prevent tank warping). Would not the first stages slow to subsonic speed on their way down, even without parachutes? I’m guessing they would fall tail-first, because of the weight of the engines. So the first stage boosters could be made reusable? The core or second stage presents a much more complex set of problems. I like the idea of making it a more aerodynamic shape and skipping it in and out of the upper atmosphere inducing drag to reduce speed for rocket powered vertical landings? The first stage boosters on the Heavy will probably be among the first things SpaceX manages to make reusable. The central core – and the first stage of the standard Falcon 9v1.1 – represent a greater challenge, but it’s still well within their reach to make them reusable as well. That will probably happen within the next two years, barring unforeseen problems. The second stage… that’s where things get dicey. The second stage makes it all the way to LEO (Low Earth Orbit) at the very least. In some missions it enters a GTO (Geosynchronous Transfer Orbit). Either way some fuel – and potentially a fair bit in higher, more circular orbits – will normally need to be expended to bring it back down into the thicker parts of the atmosphere. Once that happens it will need to have a heat shield to protect it just like any orbital reentry vehicle. That’s expensive and heavy. I suspect some sort of materials breakthrough will be needed to create a better, cheaper, lighter heatshield before we see second stage reuse become commonplace. Use of the same revolutionary material – PICA-X, the Dragon Capsule’s heat shield is made out of should work… I’m visualizing a second stage booster fairing/shape that resembles the X-51 Wave Rider but with two concave lengthwise grooves for the two first stage boosters. Hypersonic wedgie thang, coated with PICA-X! Rocket augmented hybrid aerospike engines anyone? How about… In future, the flyable re-entry booster section has seating for 100. Each space launch is part of a regular 1 1/2 hour flight from Beijing to New York or back. At the apex of the boost phase the third stage separates, fires it’s rockets and goes into orbit while the second stage reconfigures for hypersonic re-entry and landing half way across the globe…. I’m hoping so much to see landing legs on the next lauch! And maybe at least partially successful landing? Or is it too much to hope for? Bonus on the fuel loading with a tail first descent? I keep thinking use a tiny supersonic drogue chute for high speed descent stability… with high temp rated engines facing into re-entry heat. If there wasn’t any nasa help, how long it would have taken them to create the rocket especially the engines. They would. But the question is would they still be useable after all of the stresses that would have been placed on them during deceleration? After all, those 22 story high tanks are pretty much just thin tin cans. There isn’t much to them. In order to rapidly reuse the tanks (without extensive expensive refurbishment) they have to be in pristine condition. Even the small stresses placed on the tanks during a parachute assisted water landing would be enough to warp the tanks, preventing them from being reused. Not to mention salt water is crappy stuff when it gets into a rocket;). NASA had terrible trouble with salt water damage when “reusing” (ie, replacing virtually every part on them) the SRBs on the shuttle because of salt water damage.